Powerful Effort, under jockey Eduardo Nicasio, cruises to victory in the Grade 1 $198,700 Los Alamitos Winter Derby Saturday night. LOS ALAMITOS, CA—FEBRUARY 9, 2019—Connie Rosenthal went for it when she saw Powerful Favorite enter the sale ring at the 2017 Los Alamitos Equine Sale. "We wouldn't have this horse if it wasn't for Connie," trainer Chris O'Dell said. "She doesn't like to talk about it, but she's the one that raised her hand during the bidding and bought him. The Rosenthals paid $90,000 for this horse. That's a nice chunk of money. When the horse entered the sale ring, Connie asked me if this is the horse that I liked. When I said that it was, she said, 'well, let's get him.' "
And what a great purchase he has turned out to be. 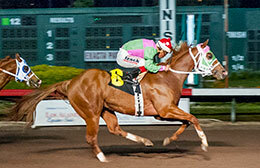 A gelding by Favorite Cartel and out of Remember Me Rose, Powerful Favorite scored his second stakes victory on Saturday night after pulling away in the final 200 yards to win the Grade 1, $198,7000 Los Alamitos Winter Derby by 1-¼ lengths while improving record to five wins from 11 career starts. 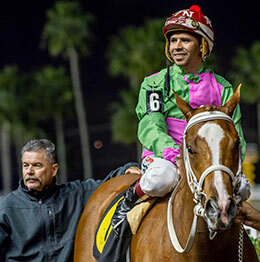 Ridden by Eduardo Nicasio, Powerful Favorite earned $83,454 for the win to take his career earnings to $404,915. 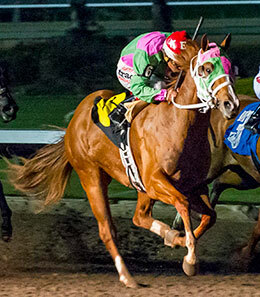 Bred by James Markum and Dr. Steve Burns, Powerful Favorite won the Governor's Cup Futurity last year and qualified to the Los Alamitos Two Million Futurity, Golden State Million Futurity and Ed Burke Million Futurity. 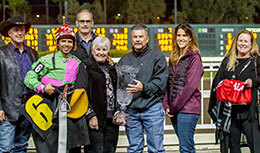 Winning trainer Christopher O'Dell and owner Connie Rosenthal win the Los Alamitos Winter Derby win circle. In the Winter Derby, Powerful Favorite lived up to his name. He broke sharply from post number six and finished powerfully as the 6-5 favorite to cover the 400 yards in :19.774. "He got a decent start and didn't get bumped around," O'Dell said. "That's a big deal. Once he starts going, that horse sees dollar signs. When he gets down at the end of the race he kicks it into gear. We're so proud of him and I'm so grateful for the Rosenthals. If (Connie) doesn't step up and buy the horse we wouldn't be here right now. She raised her hand and bought it. She bid on him one time and bought him." Purchasing him was the first step, then came the work. "Chris has done a wonderful job with him," Connie Rosenthal said. "John Firth did a fabulous job breaking him and he said all along that he was going to be a good horse. This is what we hoped for and to have it be a reality it's just a blessing. It's truly wonderful." "What a great team effort with my assistant Adalberto "Maloso" Aceves, the grooms, and Eduardo Nicasio, who spent a lot of time on the horse. This horse was terrible in the gates. Even the first time he ever ran, he threw some fits in the gate. We put our heads together and came up with the flipping halter. We've had good luck with that. I don't know for sure what we'll do next. He's in the El Primero but we may skip it and look for some other things. We'll see." Like O'Dell said, Powerful Favorite has had his moments in the starting gate. Even in the trials to the Winter Derby, he broke through the gate after some other horses acted up, but still managed to settle down and win by a length. Knowing that the gates can be an adventure with Powerful Favorite, Nicasio was prepared for any type of situation. "He had me a little nervous because this horse has a strong temperament," Nicasio said. "He was calm (tonight), but he always keeps me on my toes. He didn't fly out of there, but he finished great. He's an outstanding horse. I've always liked him. He felt great as he was pulling away from the rest. Chris is really doing a great job with him. It's a good team." For Connie Rosenthal, watching Powerful Favorite return to the winner's circle was one of the biggest joys of her night. In 2016, Fire At Will gave Connie and her late husband, Bob, their first ever Grade 1 victory when he captured this race. Unfortunately, Fire At Will suffered a serious injury, had to be vanned off, and was eventually euthanized. "It was exciting this time because (Powerful Favorite) crossed the finish line and he walked back to the winner's circle. This is our second Winter Derby, but we didn't get to enjoy the first one. This is really special." Powerful Effort, under jockey Eduardo Nicasio, crosses the wire first in the Grade 1 Los Alamitos Winter Derby. 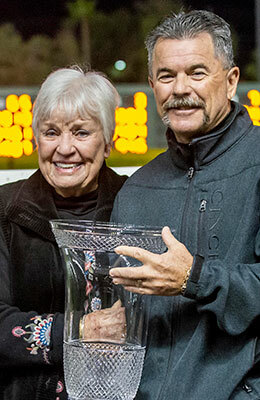 Just over two weeks ago at the Pacific Coast Quarter Horse Racing Association Awards Banquet, the Rosenthal Ranch received the Frank Vessels Sr. Memorial Award for their contributions to the sport of Quarter Horse racing. It was an emotional moment for Connie and her family, as she shared with those in attendance how much racing meant to her loving husband. And after a strong 2018 season, it seems like Powerful Favorite is determined to keep providing good moments in racing for the Rosenthals. "I can't fathom this (past) year, now the beginning of this year and what's happening," she added. "This horse is magnificent. This is what we hoped for and to have it be a reality is a blessing. It's truly wonderful." Owned and bred by Martha Wells and trained by Matt Fales, Red Hawk Cartel ran a tremendous race from post number three to finish second behind Powerful Favorite. A full brother to the stakes winner Yanque, who'll be in action in Sunday's Brad McKinzie Los Alamitos Winter Championship, Red Hawk Cartel was fifth out of the gate before he started rolling late to outdueled top rivals for second. Ridden by Erasmo Gasca at 16-1 odds, the colt by Favorite Cartel earned $33,779 for his runner-up effort. Red Hawk Cartel is out of the Hawkinson late mare Red Hawk Chick. O'Dell saddled Parsons Family Limited Partnership's Terrific First Down to a third place finish after she also made a late move. The daughter of FDD Dynasty and out of the Mr Jess Perry mare Terrific Energy earned $23,844 for finishing third. The top three finishers were followed by Mister Appolitical, Heza Blues Man, Ladys A Cartel, I Like My Chances, Singles Cruise and Cole Man 47.